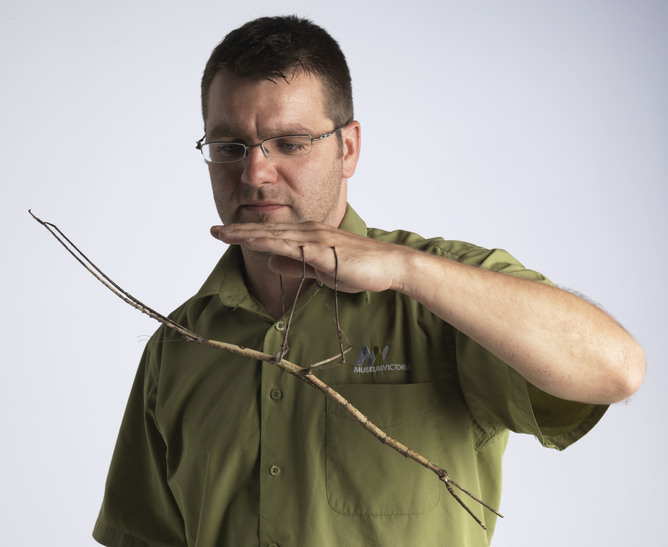 It’s not often you get to raise a clutch of stick insects that can grow to nearly 60cm long. But I was given the rare privilege of doing so recently when I nursed the batch of eggs laid by the longest Australian phasmid, Ctenomorpha gargantua, nicknamed “Lady Gaga-ntuan”. Lady Gaga (for short) was discovered and collected in January 2014 and laid 12 eggs during her remaining weeks of captivity. Almost nothing is known about this species’ biology, and despite its size, females seem to be very elusive. Being the first ever adult female of this species in captivity, Live Exhibits at Melbourne Museum had to make the most of her and her eggs, which were to kick start a new population and secure that species in captivity. So, the eggs were passed onto me with the hope they were fertile and faith in my ability to rear a new generation of the giant phasmids. Due to my background in keeping various phasmid species overseas, and having now set up several phasmid colonies privately, I had a good feeling about this. Another upside to raising the animals at home was that I’d have the opportunity to monitor activity patterns and feeding behaviour throughout the night. I set up the eggs for incubation just like I would most of my other phasmid eggs: I placed them on a mix of 50% sand and 50% coco peat in a simple takeaway container. I sprayed it once or twice a week, but never let it dry out completely. We didn’t know whether the eggs were even fertile, so it was a terrific surprise when the first nymph hatched on September 7, 2014. I offered the newly hatched nymph fresh Eucalypt, which it readily accepted. It wasn’t necessary to trial possible food plants, as Jack Hasenpusch (owner of Australian Insect Farm) managed to rear a nymph on potted Eucalypt. Unfortunately it didn’t survive to adulthood, but it gave us a good indication on food plant acceptance. Three days after the first nymph, a second and third hatched, and by October 2, seven nymphs had hatched. The other five eggs are very likely to be infertile. I started raising all nymphs together in a mesh cage, which I placed into a reptile melamine enclosure with temperature controlled by a thermostat. The background temperature was set to 28C and I mist sprayed the whole cage in the morning and in the evening to supply at least 85%-95% humidity. To avoid over-handling, I only supplied potted food plants instead of cut branches, and changed them when most of them were eaten. The plant species were chosen with regard to the plant species we have here at the Melbourne Museum. I’ve rotated lilly pilly (Syzygium australae), brittle gum (Eucalyptus mannifera) and mountain ash (Eucalyptus regnans), which were equally well eaten. The unassuming eggs also have excellent camouflage. The nymphs were growing and progressing fast, but by the time they had their third moult, some animals seemed very sluggish and wouldn’t move for days. That concerned me a lot, so I started feeding leaves directly into their mouths. 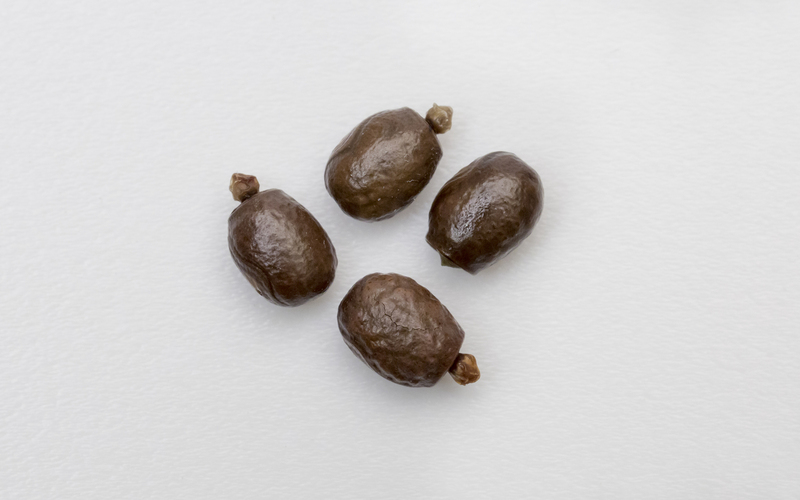 After four days, five out of seven nymphs were immobile and wouldn’t accept any leaves when offered. I drip fed these animals glucose with no effect and made the decision to totally modify the husbandry process and save what was possible. I moved the mesh enclosure out of the reptile enclosure, with the attempt to keep them only at a non-stable room temperature, but more air movement and only mist spray once a day. The five immobile nymphs were individually offered thinly sliced apple, which was readily eaten. The next day, all seven nymphs were feeding on potted mountain ash and have had no other issues during their development. They all went through the next moult without any problems, and by that time I was able to distinguish the sexes. Males were slim build and had a bulging sub genital plate, which was lacking in females. Also, the cerci in female nymphs were much longer as well. 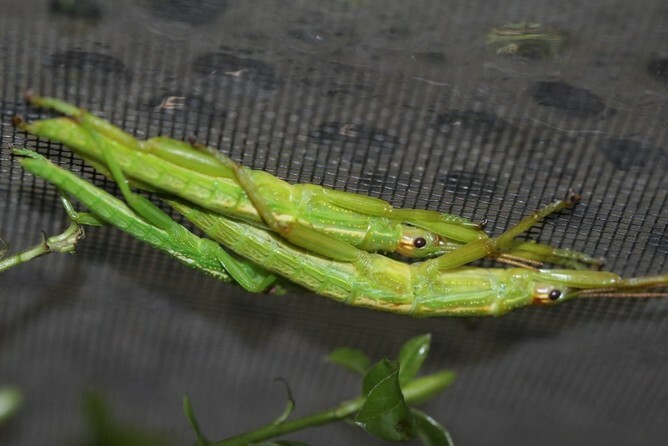 A total of three male and four female nymphs suggested that “Lady Gaga-ntuan” had mated with a male and didn’t reproduce parthenogenically. Due to the lower ambient temperature, the nymphs took a long time to develop. The first animal that moulted into adulthood was a male, on October 6, 2015, more than one year after hatching. Within four weeks, all of the animals had their final moult. The author with the mother of the brood, dubbed Lady Gaga-ntuan. Every one of the four females exceeds their mother, Lady Gaga-ntuan, in size, with the longest being a proud 56.5cm in total length. All three males have been mated across the four females, which have started laying already. With perfect climate conditions and suitable browse, I’m confident to say that it is without doubt possible to produce specimens up to two feet (61cm) in length, which will make this insect the worlds longest. At present, two adult females and one adult male are still alive and are on permanent display at the museum. It has been a great opportunity for me to rear this interesting species for the first time and pave the way to establish and secure the captive stock. The eggs will be incubated and later reared at Live Exhibits in order to build up sufficient numbers for displaying Australia’s (and possibly the world’s) longest stick insect. If you haven’t heard of the Lord Howe Island stick insect, you have missed out on one of the most remarkable conservation stories of the decade. This week’s news is that breeding colonies of Australia’s rarest insect will soon be established in zoos at San Diego, Toronto and Bristol. These new colonies will join those at the Melbourne Zoo and the Lord Howe Island Museum to ensure the future of this unique species. This remote and almost inaccessible population was the key to survival for the phasmids, but presented enormous difficulties for scientists who wanted to study them. Eventually an expedition was arranged to collect live specimens, which had to be done at night when the insects are out of their burrows and active. The story of the captive breeding program is almost heart-stopping with many twists and turns. The original pair held at the Melbourne zoo were named Adam and Eve and because almost nothing was known of their lifestyle and habits, trial and error and careful observation were needed to provide them with appropriate care. At one point Eve nearly died but was revived when zookeeper Patrick Rohan carefully dropped a mixture of sugar, calcium and ground melaleuca leaves into her mouth. Eve’s first egg hatched on Threatened Species Day on 2003, and although this wasn’t the end of the challenges facing Melbourne Zoo staff, it turned out to be the beginning of hope for the species’ successful captive breeding program. I became personally acquainted with these insects when the zoo allowed selected schools to hatch some eggs and one of the babies spent time at my house. A film of her first steps and the story of our excitement was published here in 2012. Sticks that spoon: juvenile Lord Howe Stick Insects hatched at Tallangatta Secondary School in 2012. The Lord Howe stick insects start out small and green but grow up fat and black. They spend their days curled up together in burrows and head out at night to feed. Their story has caught the attention of David Attenborough and Jane Goodall. If you want to know all about the story of the Lord Howe Stick Insects, two recent books are ready for you to devour. For adults, Return of the Phasmid: Australia’s rarest insect fights back from the brink of extinction, by Rick Wilkinson provides a comprehensive and fascinating summary of the history, geology and human drama involved in this story, complete with great photos and personal accounts. Anyone who wants to understand what it takes to bring a species back from the brink will find it great reading. Additionally and delightfully, the invertebrate zookeeper Rohan Cleave has released a children’s book, Phasmid: Saving the Lord Howe Stick Insect, with lovely watercolour illustrations that bring phasmids to life for young hearts. Soon these books will become important in a global context, as people in San Diego, Toronto and Bristol get to meet our very own ‘walking sausages’.